180 руб. 185 шт. 2-3 недели 5 шт. 5 шт. The Vishay 038 RSU series is radial leaded, ultra miniature, standard aluminium electrolytic capacitors. 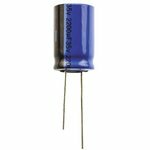 These capacitors are available in standard capacitance value ranging from 2.2µF to 22000µF and ±20% tolerance. Typical applications include audio, video, mobile equipments and general purpose electronic circuits.